Tuesday 15 July was such a beautiful day that I decided to have a transport odyssey. 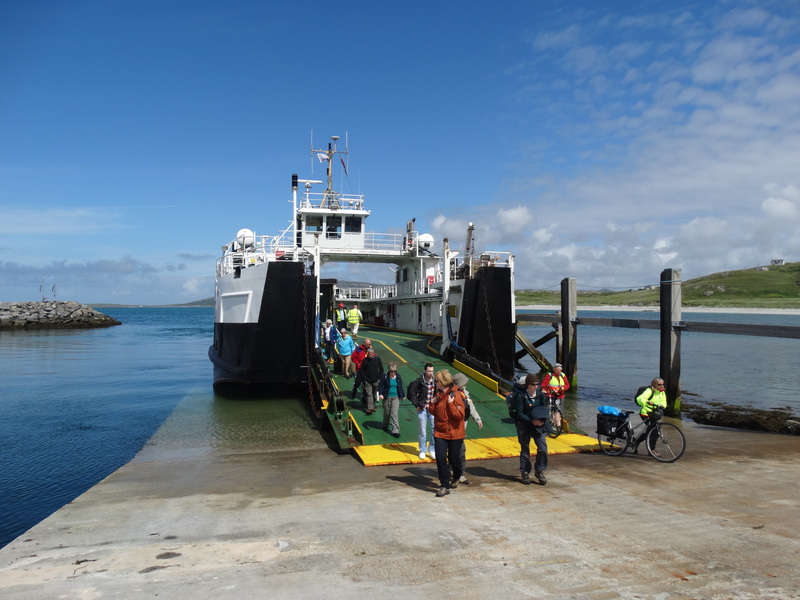 I had already worked out that the ferry left Lochboisdale on South Uist for Castlebay back on Barra at 1900, so I chatted to the lovely lady in the tourist office about my options. 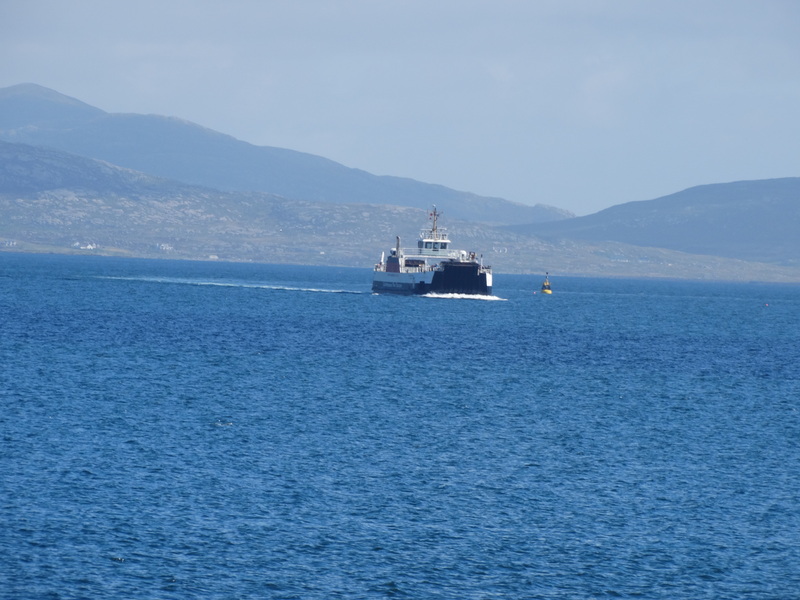 I could catch the 1025 bus from Castlebay to Airdmhor Slip, then the 1110 ferry across to the Isle of Eriskay. 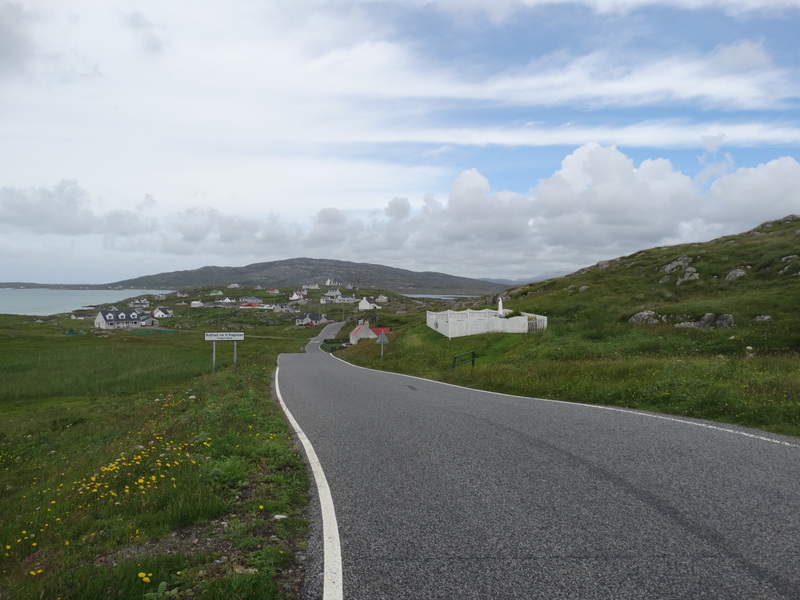 Arriving on Eriskay at 1150 I could catch the bus north, but my friend told me I had to explore the island – and she was right. The lovely beach is Coillesg a’Phrionnsa, which is where Bonnie Prince Charlie landed on 23 July 1745. As the tourist leaflet says “he was told by Alasdair MacDonald of Boisdale to go home”. Interesting how different history might have been if he had. 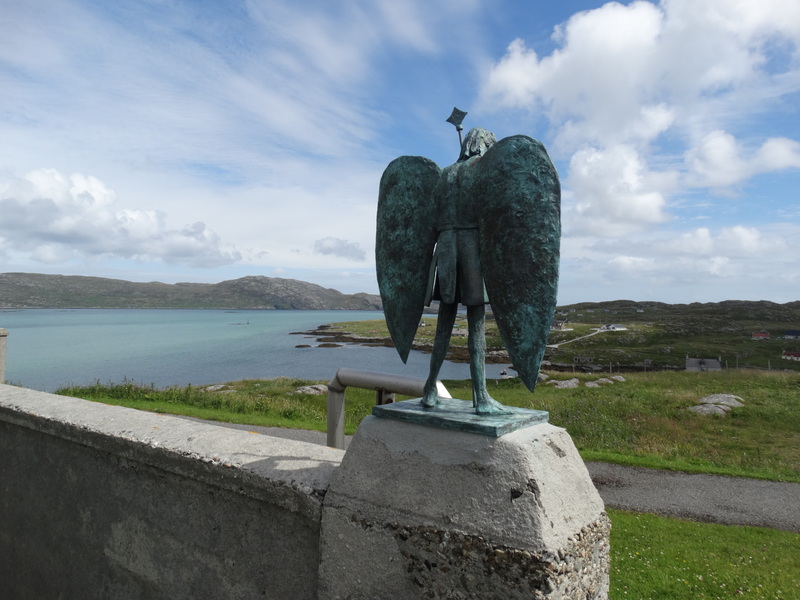 Following the road I came to a wayside shrine, built on the site of the original Eriskay church. 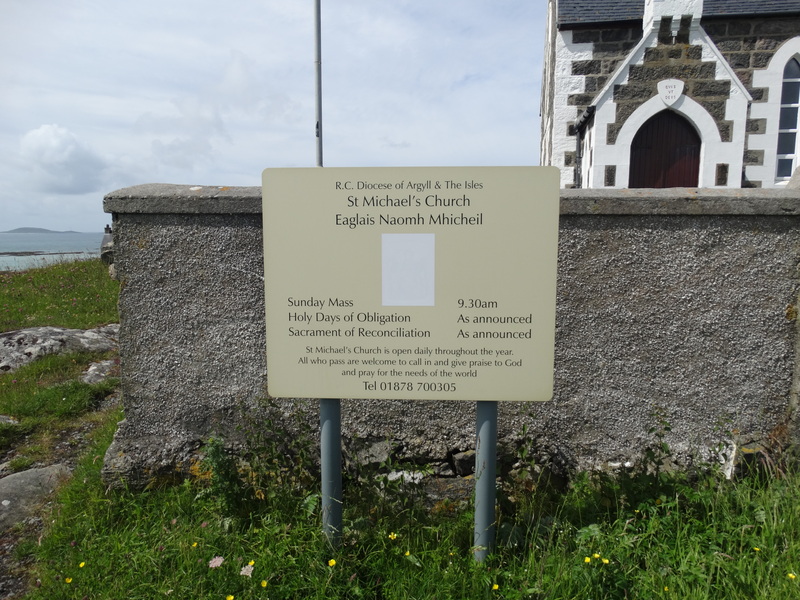 St Michael’s church had been built in 1851, but it was far too small. 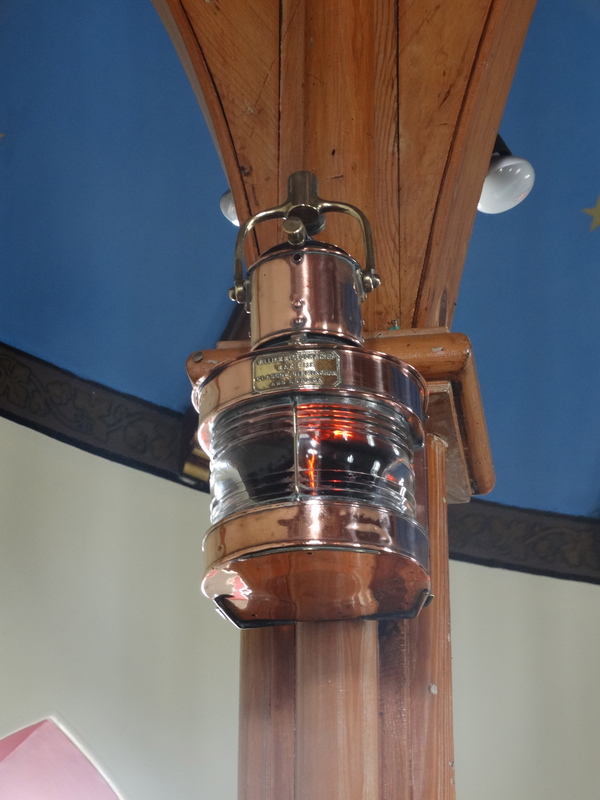 Now Our Lady of Fatima has a good view. 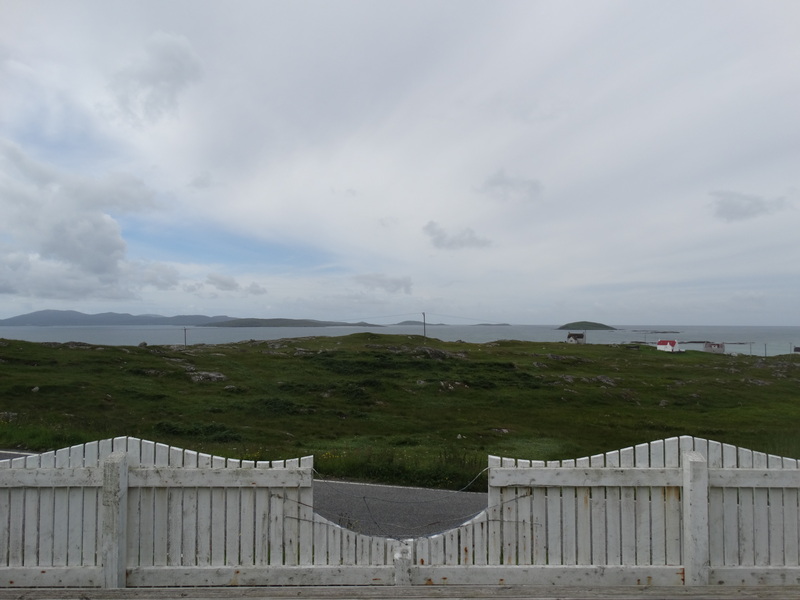 On a day like this you could believe that everything in Eriskay is always beautiful, but it is a place of hard work. I have just finished reading this book: Roger Hutchinson, Father Allan: the life and legacy of a Hebridean Priest, Edinburgh: Birlinn, 2010. Born in 1859 in Fort William, Allan MacDonald trained at Blairs College and at Valladolid in Spain. He served in Oban from 1882 to 1884, then South Uist 1884 to 1894, then in Eriskay 1894 until his death in 1905. It is no exaggeration to say that he worked himself to death, caring for his people. 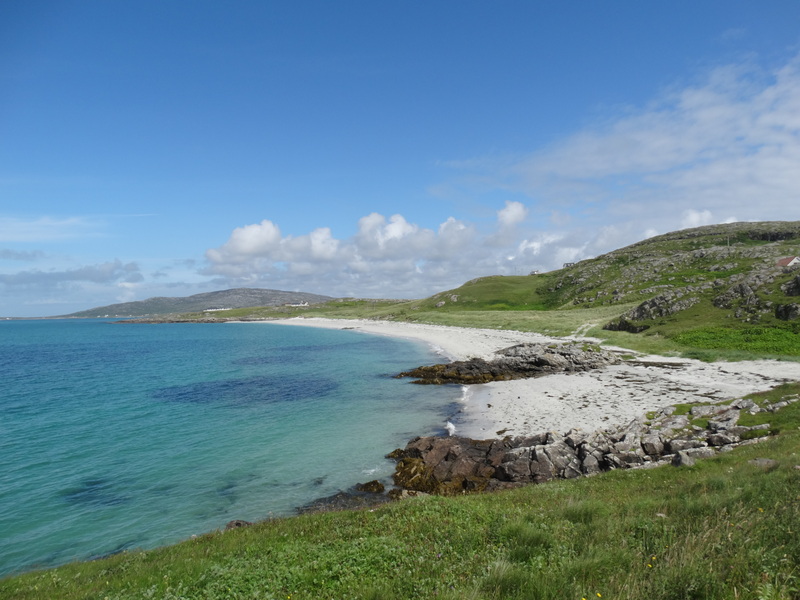 Eriskay was one of the few Hebridean islands whose population had increased in the mid C19. 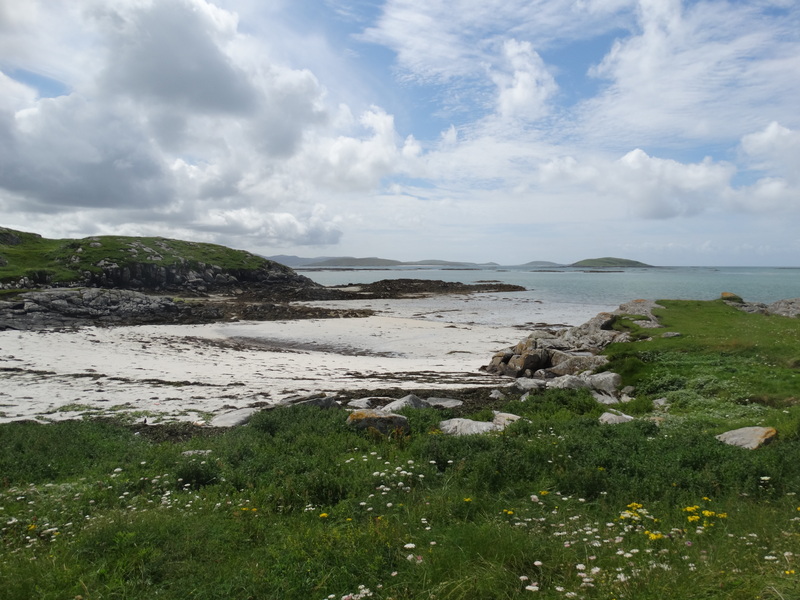 “Considering the estate to be agriculturally worthless, it had been used by Colonel John Gordon’s agents as a dumping ground for people evicted from elsewhere in the southern Outer Hebrides” (page 130). 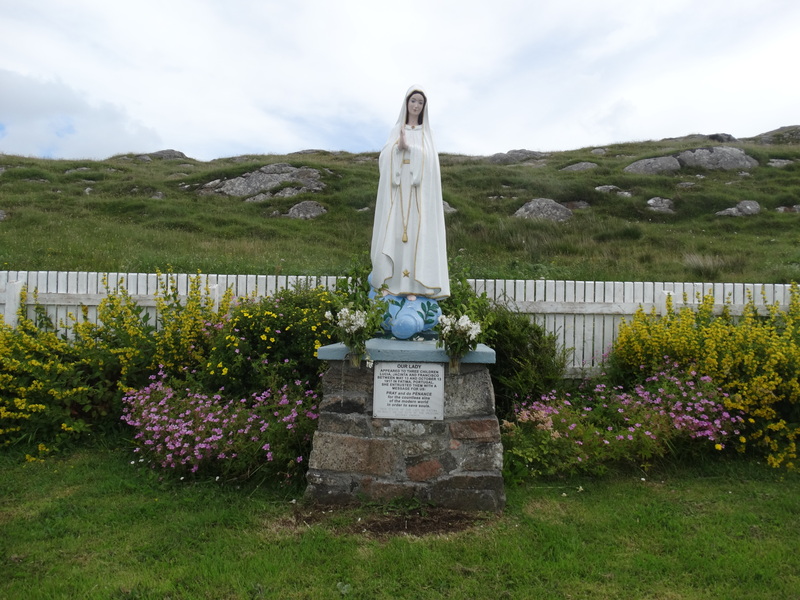 80 people on the island in 1841, 454 in 1891 – nearly all Catholics, nearly all living at subsidence level. 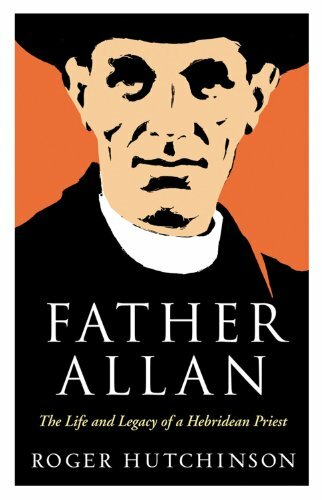 Father Allan gave practical care, spiritual care, and regularly fought their battles with landlords and government. He did all of this on a pittance – “living frugally” says the book. Most (almost all) of the population spoke Gaelic, and Father Allan became an authority, an accomplished Gaelic poet and writer, and one of Scotland’s greatest collectors of folklore. I walked on a bit further, on into the main part of the village. The Village Hall has a summer cafe so I went there for a toasted sandwich. 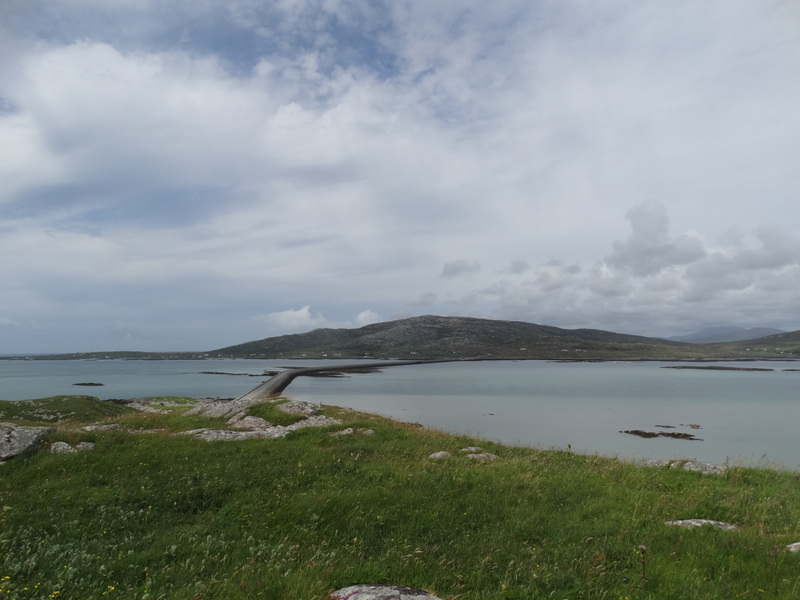 Some young families around, which must be good news – Eriskay had a population of 143 in 2011. There is a lovely 1935 film “Eriskay – a poem of remote lives” on the Panamint Cinema dvd “The Rugged Islands”. If you want obscure films, do look at their great website. 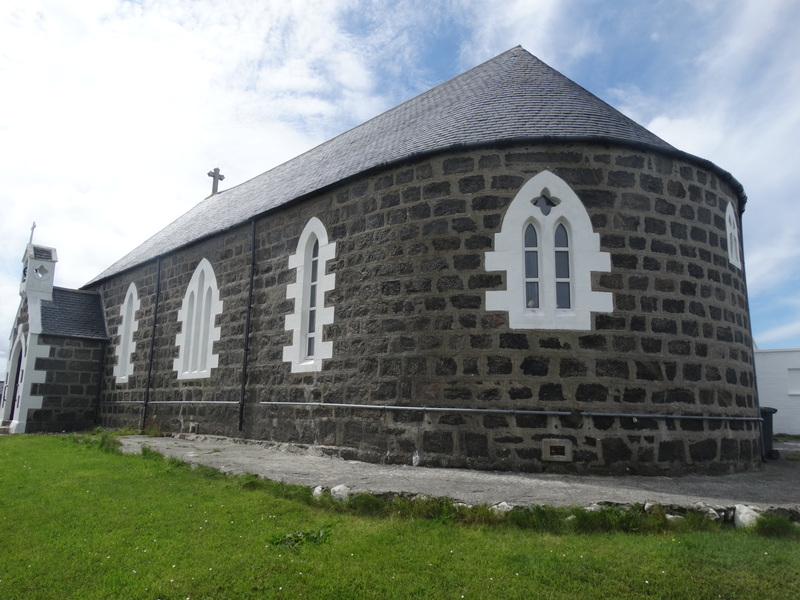 A new church was built in 1903. 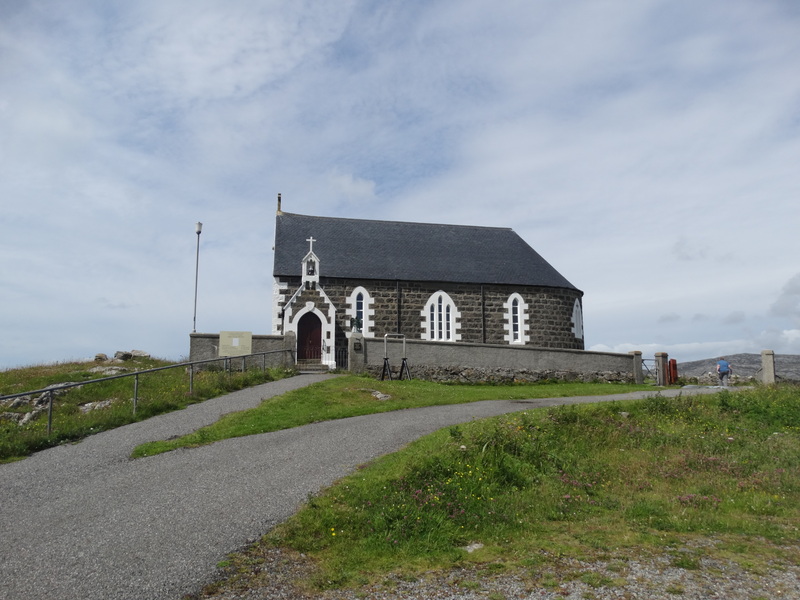 Father Allan’s Gaelic books helped pay for it, all the Eriskay fishermen gave the proceeds of a night’s fishing (“a record catch, worth nearly £200, no small sum in those times” page 169), and a wealthy man called Marc-Andre Raffalovich who had heard about Father Allan’s work on the island was generous. This purchased the lime, the slates, the glass and other building material, but the islanders “quarried the stone from the side of Beinn Sgrithinn, the highest hill on the island. They carried sand for cement from the beaches” (page 170). There is an external handrail that runs round the outside – to hang on to in the wind? 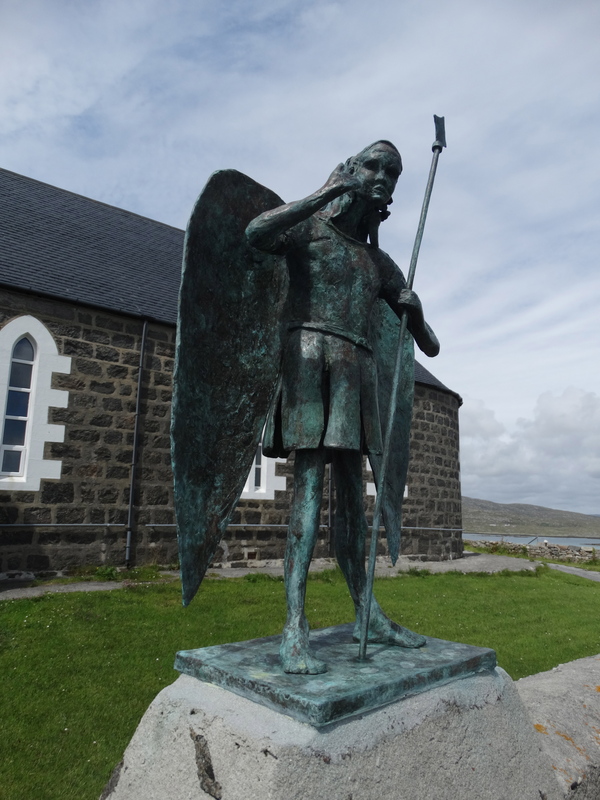 There is a new statue of St Michael by the gate in memory of Father Calum MacLellan, another star of “The Island Parish”. He died in 2012 – obituary here. 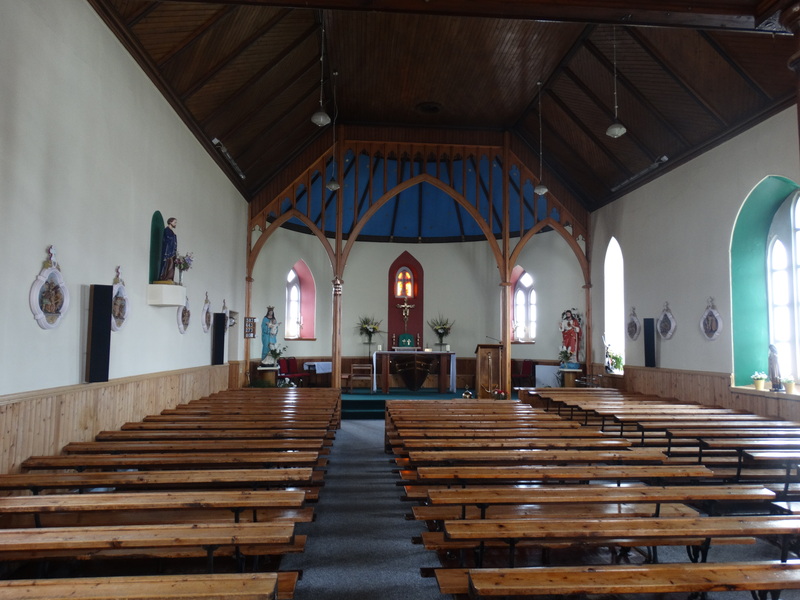 Rather sadly, since his retirement the parish is now served by a priest on South Uist and the priest’s house is empty. 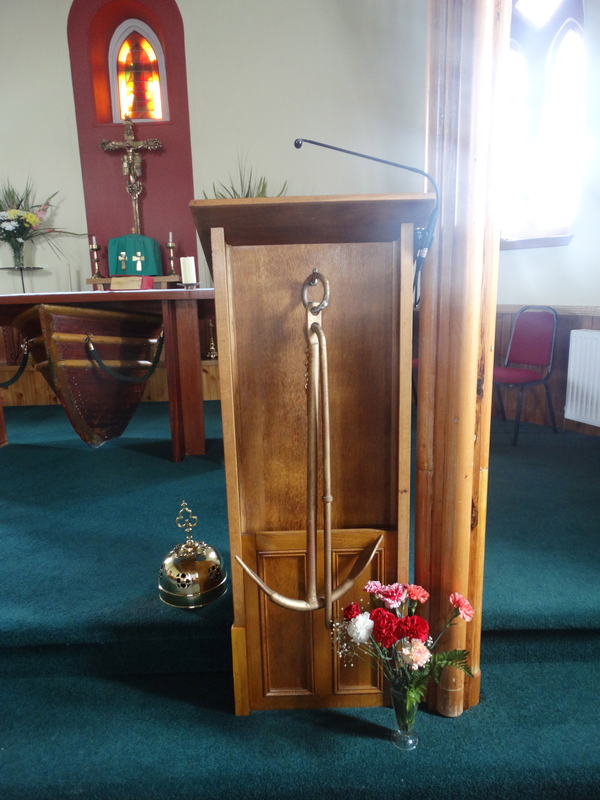 The bell over the porch is from the German battleship SMS Derfflinger which was scuttled at Scapa Flow in 1919. 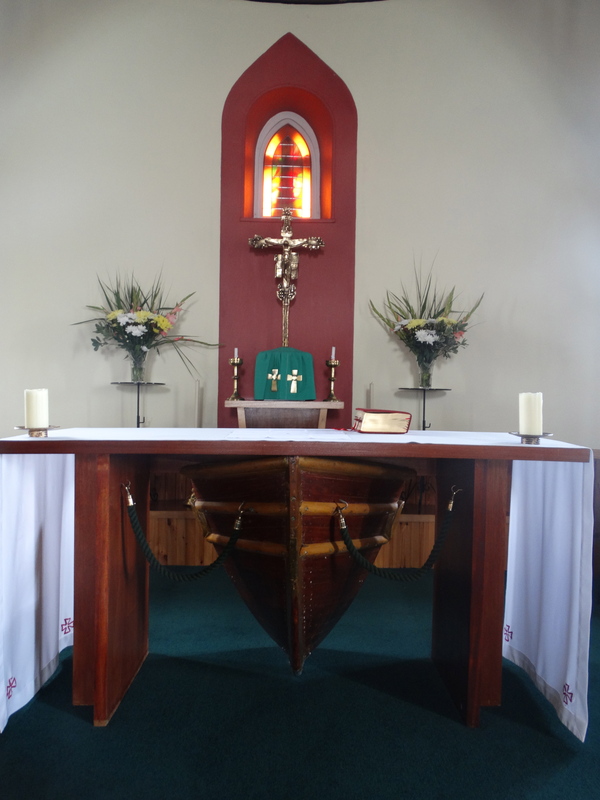 The altar, which celebrates the island’s fishing heritage, is gorgeous. 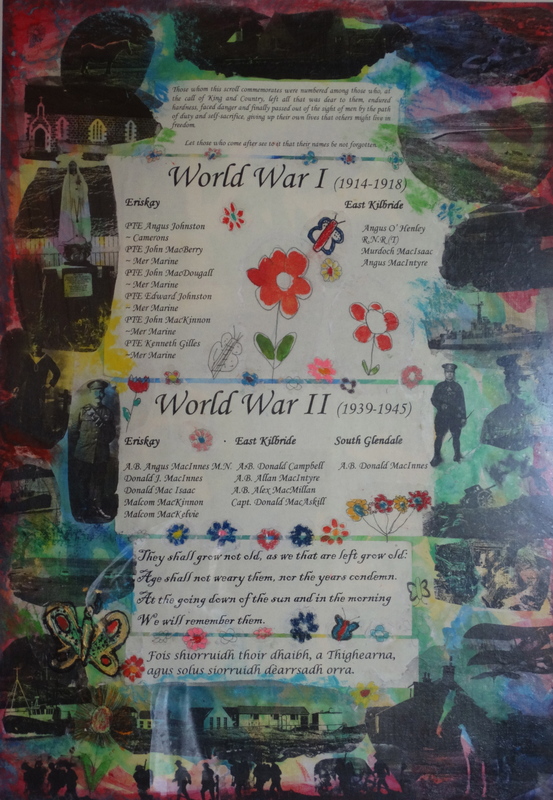 There’s other nautical things, and a lovely War Memorial. 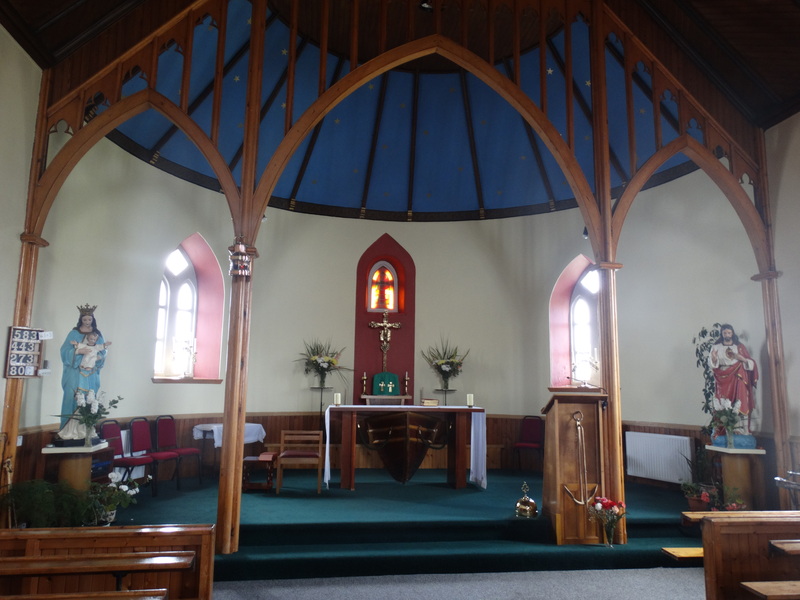 A lovely church. I looked down on the causeway to Uist, built in 2001 – it should help keep the population up. I walked down to it, sat on the beach for a while, then caught the 1430 bus north to Kildonan Museum. 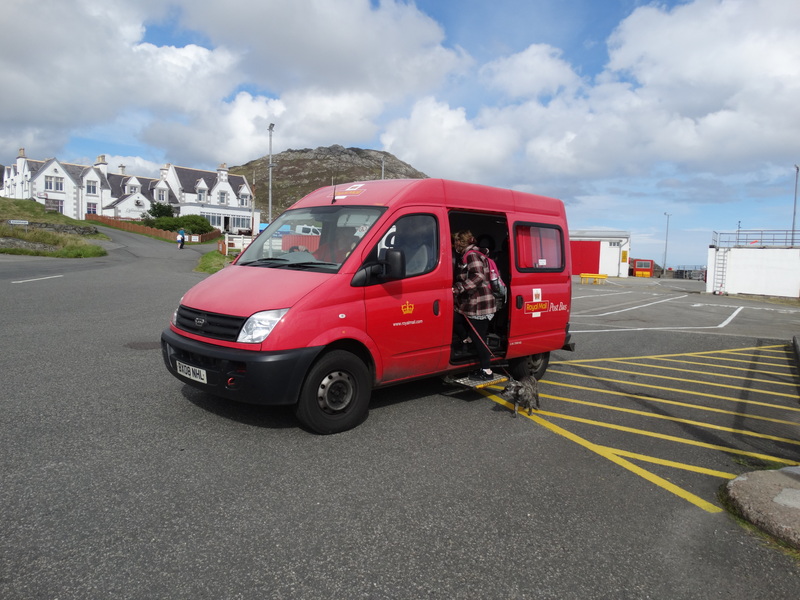 Later the Post Bus down to Lochboisdale, a drink in the hotel bar and the 1900 ferry. I had a curry, then went and sat on the top deck. 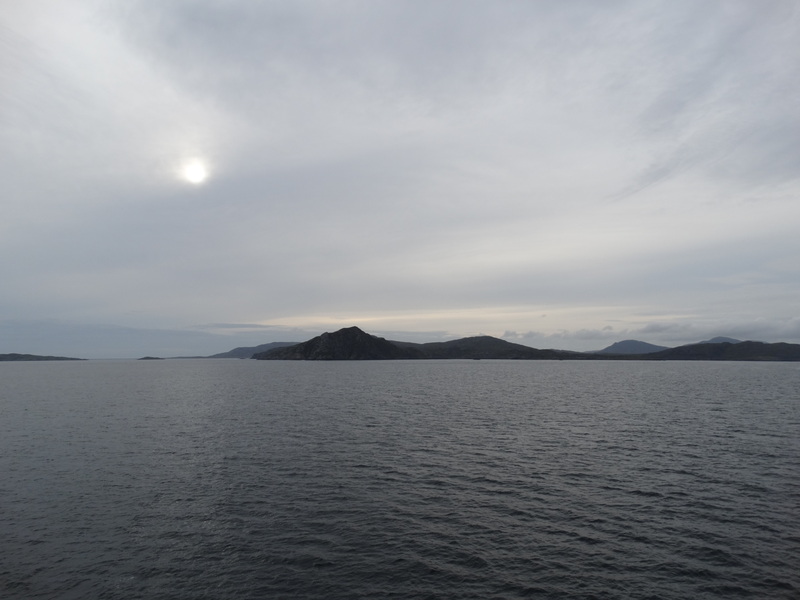 A little breezy, but I’m built of stern stuff – my forebears were Viking warriors. It was a little dark, shame that it wasn’t as sunny as earlier. 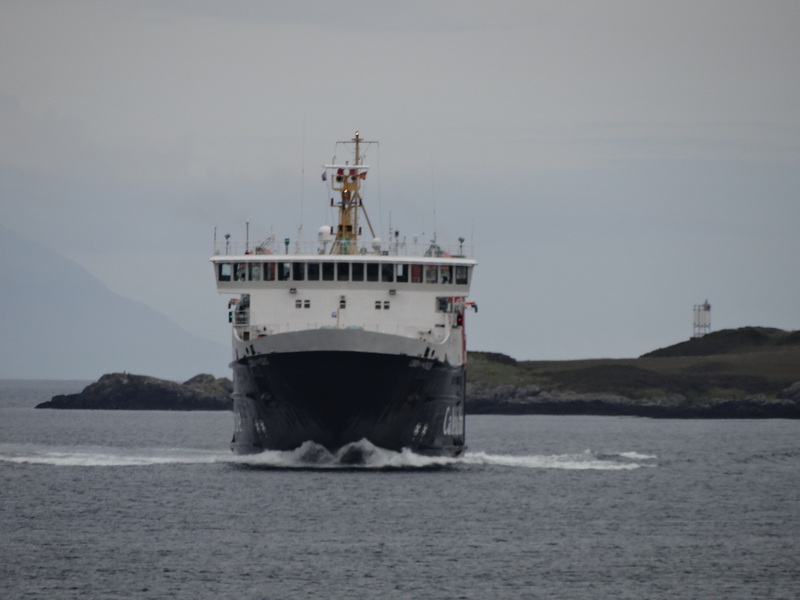 We rounded the bottom of South Uist, then south with Eriskay on the port side (or was it the starboard side), crossed the Sound of Barra, past Gighay and Hellisay (I can’t manage the Gaelic), then Flodaigh and Fuidheigh (no English given), and down the coast of Barra. 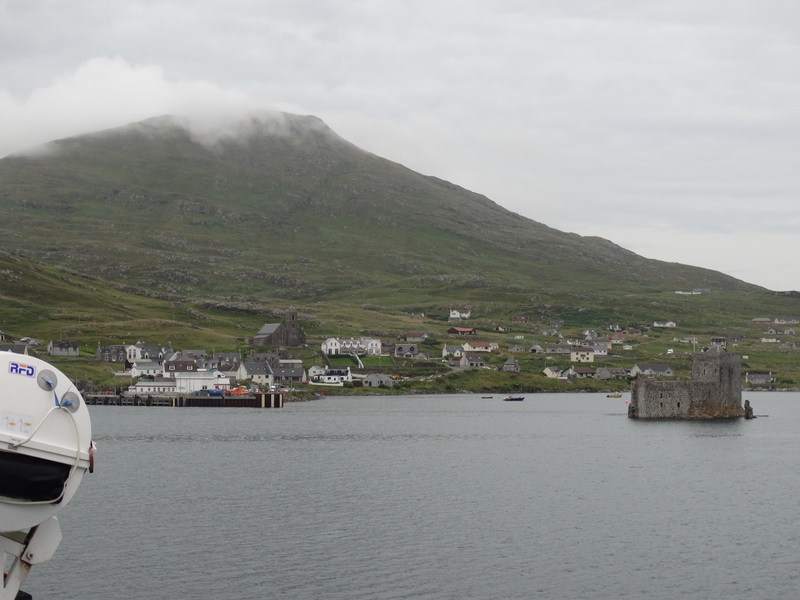 As you come into Castlebay the Isle of Vatersay stretches along the left side – and the castle is on the right. It would make a marvellous holiday home – “Julie, I’ve booked us into a castle. You can only get there when the tide is out. You’ll have to go on a plane and land on the beach.” Those of you who know my wife will know what her response would be … . Now you know why I went on this holiday by myself!